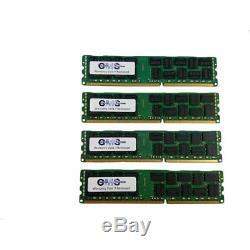 4 pieces of 8GB DDR3 ECC REGISTER DIMM PC10600 2RX8 240PIN. Standard Memory: 1 GB (Removable). Maximum Memory: 16 GB ECC UDIMMs 32 GB Reg ECC RDIMMs. Expansion: 4 Sockets for ECC UDIMMs 6 Sockets for ECC RDIMMs. Comments OUR DDR3-1333 modules automatically clock down to 1066MHz and 800MHz depending on which Intel Xeon model is installed and how many module Banks are populated. Due to chipset limitations, DDR3 Quad Rank memory will operate at 1066MHz in the first Dual Channel bank. Adding Quad Rank modules in the second Dual Channel bank will operate at 800MHz. Third Dual Channel bank, if present, is disabled. This system supports six (6) Single or Dual Rank Reg ECC RDIMMs or four (4) Quad Rank RDIMMs or ECC UDIMMs. Mixing Registered ECC and Unbuffered ECC modules is not supported within this system. Intel Xeon 3400 series proces. We will not accept any item that has physical damage. Physical damage is any damage that is not caused by any normal wear and tear. The item "32GB (4x8GB) Memory RAM for Dell PowerEdge T310 QUAD RANK ECC REGISTER (B26)" is in sale since Monday, July 9, 2012.